The youngest generation guides is so hard that they can break with the least impulse. The inner ring, Sic or titanium oxide or other material, usually will break because of a pressure caused by hitting something, deforming the metal frame or by falling on a hard surface. Rarely while playing a fish. One or more pieces has been broken from the Sic or titanium oxide ring, which damages the line. 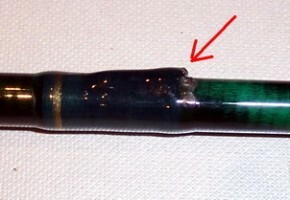 The broken edges are very sharp and will lead to a line break. the ring is broken in half or the entire ring has fallen out. The only good solution is to completely replace the broken or damaged guide. Single-leg guides sometimes break off at the foot, usually by a thrust or by squeezing or forcing them when disassembling the rod! 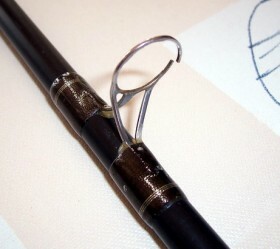 Fishermen who use braided lines on older rods may discover that certain guides have notches or incisions that damage the line. These should best be replaced by titanium oxide or Sic eyes. 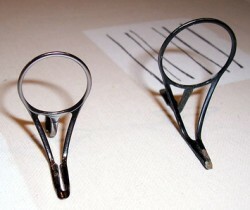 Usually these will still be aluminium oxide or hardloy rings and these are not suitable for braided lines. 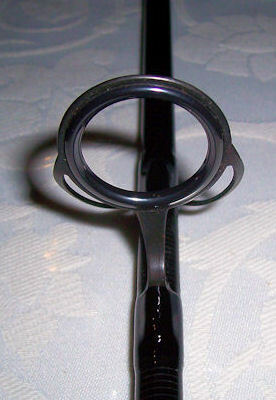 On many commerciël rods, the guides are on the wrong side of the blank. This can be easily tested by slightly bending the top section. Place the top section with the put over side on the floor. Support the top and press lightly somewhere in the middle of the top part. You will see and feel that the rod turns itself s to the right side. 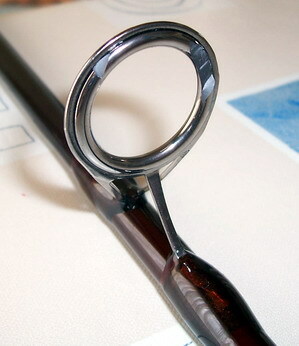 If you see that the guides pointing towards the side of the rod, than they are on the wrong side of the rod. 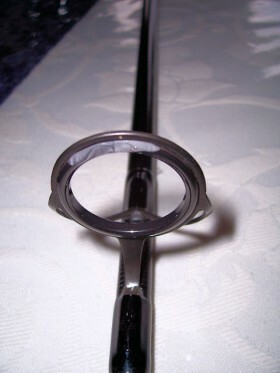 Normally the guides should point to the up or down side of the rod. I Always place the guides on the right side of the blank. This is a mistake that I see often. Even with very expensive rods. Problem is that, if you play a fish, the top section constantly tends to pull to the right side. When you have placed the tip section not firmly onto the bottom section, it can happen that the tip section turns during playing the fish. This is obviously an unpleasant situation. It can also give a negative influence during casting the line. 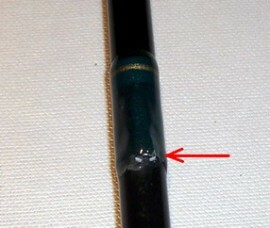 If you have damaged guide on your rods, or if you notice that they are on the wrong side of the rod, please feel free to ask what can or should happen with it.